Sami Aslam's international career seemed to have taken off after his odds-defying innings of 82 and 70 during the 3rd Test on Pakistan's successful tour of England in 2016. Whilst it seemed that the left-handed opener was well on his way to becoming an established name in the Pakistan side, the facts are that 22-year-old Sami Aslam played only 13 Test before finding himself excluded from the national side having last represented his country in 2017. In an exclusive interview with PakPassion.net, Sami Aslam spoke about his disappointment at not being awarded a central contract, his disbelief at constant exclusion from the Pakistan side, answered criticisms about him being too defensive a player, wondered why he has not been able find a place in a PSL team in all three editions of the tournament and put forward his aims to be the best batsman in the ongoing domestic season. PakPassion.net: You are not in the international reckoning and have no central contract either; dark and disappointing times for you at the moment? Sami Aslam: I'm not a bit disappointed, I am very disappointed. I was included in the squad for the tour of England and then to be totally out of the reckoning for the 33 players awarded central contracts is hugely disappointing. PakPassion.net: Why do you think it is that you are now totally ignored for selection and for central contracts? Sami Aslam: I have no idea as last season in domestic cricket I performed really well amongst all the formats, so I am mystified as to why I am suddenly deemed not good enough for the squad or for a central contract. PakPassion.net: You seemed quite down and disheartened and downbeat during the tour of England. Why was that? Sami Aslam: When I went to England. I thought I would get a chance to play having done well on the tour of England in 2016, so mentally I was ready to play and perform and I thought I would be in the starting eleven. So, when you are part of a touring party and you never even get a chance to play then there will be some disappointment. But perhaps the team management had other ideas, that only they can explain. PakPassion.net: Have any of the coaches or team management been in touch with you explaining why you are no longer in the squad and are without a central contact and also explained to you what you need to work on? Sami Aslam: I've had no messages or calls about this. I don't get what the reasons are behind my not even getting a central contract. PakPassion.net: Your critics say that you are not the same batsman in international cricket that you are in domestic cricket and that you are overly defensive when playing for Pakistan? Sami Aslam: There is a simple explanation regarding this. When you come into international cricket despite having played at the Under-16 level and Under-19 level, you will find a lot of differences. Every player wants to cement their place in the international team and not be forgotten back into domestic cricket after having worked so hard to get into the national team. I scored 45 runs on ODI debut against Bangladesh and then I was dropped for a year in ODIs for no reason. It's right that I have not played for Pakistan in the same way I play for my domestic teams and that is because I always felt that every game for Pakistan was my last match. I have faced the top teams abroad in England, New Zealand and Australia in tough conditions. I don't think I was overly cautious in these series and if you look at my strike-rate, it wasn’t that bad as compared to the other players. I'd be foolish if went out there every time all guns blazing and fail, knowing that the innings could be my last for Pakistan. I was the third highest run-scorer in Tests in 2016 and averaged 45 yet I was dropped for the next series in 2017 against West Indies. If I am continually making a comeback and my place is continuously in jeopardy, then I can't go out there and try to smash the ball to all parts. PakPassion.net: Are you implying that your record would have been better had you played some home series in UAE? Sami Aslam: Look, you cannot argue that barring South Africa, the toughest series away from home for a batsman are England, Australia and New Zealand and they are the three opponents I have played against all away from home. I did well in England and New Zealand. I stayed out in the middle in Australia for long periods having played for 2 Tests and then being dropped for the third Test, I opened the batting in the Brisbane Test match and I was the 6th wicket to go down. So, I've taken on board all the experience I have gained in playing in those conditions and I believe I have the capability to score runs anywhere in the world whether it's in England, Australia, UAE or anywhere else. I don't think my record is that bad as I have faced some very tough conditions so far in my Test career. PakPassion.net: You've made some good starts to your Test innings but have not been able to convert them to centuries. That must be frustrating? Sami Aslam: Yes, I agree, I should have converted some of those starts to hundreds but I still believe that my record is not too bad and certainly not one where I should have been dropped from the Test squad or the list of centrally contracted players. PakPassion.net: Things get pretty tough for a player when there is that concern that every innings could be your last one, don't they? Sami Aslam: It's like any job isn't it. You are a journalist and if you are told that you only have one interview and if it's not a good interview then you are out of a job, then you are bound to feel the pressure and make mistakes. PakPassion.net: Perhaps you needed a few series on the placid tracks of the UAE to gain some confidence at the international level? Sami Aslam: That would have been nice, but I can't see that happening in the short-term. There are two series coming up in the UAE and I'm not even in the list of centrally contracted players. PakPassion.net: Despite the setbacks, you've made a good start to the domestic season. That must fill you with plenty of confidence? Sami Aslam: In the last couple of months I've been working really hard on my batting. I don't think I have worked as hard on my cricket in my entire career as I have in the last two months. I was feeling down after the central contracts snub and there was no motivation, but then I picked myself up and said to myself that I want to have an extraordinary season this time around in domestic cricket and I want to break the record for the most centuries in a season in the Quaid-e-Azam Trophy tournament. I've had a good start and it's important that I build on that good start. PakPassion.net: How does it feel to see guys like Babar Azam and Imam-ul-Haq, players who you have played a lot of cricket with at junior levels for Pakistan, now established international players while you are looking in from the outside? Sami Aslam: There is no resentment or jealousy there. I'm still playing cricket and performing and whatever is written in your destiny will happen. Imam and Babar have made the most of the opportunities that came to them and they have done well. I'm delighted for both of them and wish them the very best in their careers. PakPassion.net: Who have you upset at the Pakistan Super League (PSL) as you've not been included in any of the first 3 editions? Sami Aslam: Let me highlight a couple of things. In the Pakistan One-Day Cup last year, we were chasing 376 and all of the selectors were at the ground watching the match. I scored 169 in that match off 126 balls and then in the final I scored 109. Then in the National T20 Cup against Lahore who had Mohammad Amir and Mohammad Hafeez in their team, I scored 91 runs off 60 balls. Then in the next match of the T20 tournament, I scored 56 at a strike-rate of almost 150. The PSL draft was the next day and I was not picked yet again for that tournament. My point is that I am picked for domestic T20 tournaments in Pakistan and there are always three or four teams wanting me to sign for them and I am always picked in the first or second round of the draft, yet when it comes to the PSL nobody picks me and I don't even get picked for the reserve players in the PSL. By all means anyone can check my List A or T20 domestic statistics and you will see that they are pretty good. PakPassion.net: Highs and lows are part and parcel of a professional sportsman's career, but you must be thinking that the way you bounce back from the low points is important? Sami Aslam: I want to be the best batsman in this season's Quaid-e-Azam Trophy and the One-Day tournament also and in the domestic T20 tournament in December. My goals are clear and that is to be the number one batsman in all of the domestic tournaments that I play in this season. PakPassion.net: If you had the opportunity to speak with Mickey Arthur and Inzamam-ul-Haq, what would you say to them? Sami Aslam: I wouldn't say anything to them really. I would much rather let my bat do the talking for me. There's not much I can do regarding the decisions they have taken, other than to just go out there in the middle and score lots of runs and perform well. They've obviously made their decision and they will have their reasons, but my focus is now on scoring heavily and winning back my place in the Pakistan team. Pakistan had a lot of defensive players when Sami was in the team. Management probably felt they couldn't really afford to carry another in the top 6 hence why he was dropped pretty swiftly despite being young. It sounds like he wants to bounce back with a few more shots in his locker, good luck to him. Good to see that he has set himself high targets. I had great expectation from Sami thinking he'd be a real classy opener for us. Regretfully, he's failed to fulfil my expectations.Just another one who talks himself up making false promises. I feel he was unfairly dropped for WI series in 2017, but even in UAE series that he played afterwards, he was makin the same old mistakes. Starting on a high is good, but you expect improvement, something he has lacked. Rather tetchy interview from Sami Aslam but I'm glad to see he wants to channel his frustration into becoming the best batsman in domestic cricket this season. He showed immense promise in that Edgbaston Test, playing Anderson and Broad like a seasoned pro and was hailed by all the pundits. However he became too cautious and when partnered with an opener like Azhar Ali - the score just wouldn't go anywhere after 10-15 overs. He failed in the warm up games before the Ireland Test and Imam's now ahead of him in the pecking order. Selectors and management thinks about him that he is lazy. I've always been a huge fan of Sami Aslam for some reason but picking up a few things from this interview seems like his attitude isn't that great. As Markhor said, he does seem a bit tetchy in this interview, I hope he's not one of those players who puts the blame on everyone rather than themselves. I just hope he can continue scoring runs in the domestic season and he will find himself back in the reckoning sooner rather than later. He might not make his way back into the XI if Azhar and Imam do well together but can definitely put himself back in the reckoning for a place in the 15 man squad for the tour of South Africa. There is always an air of entitlement and arrogance with Sami Aslam, and he also has the tendency of memorizing his statistics to the last ball, which is the sign of a player who puts his individual performance above the team. He will stage a come back at some point, but Imam has closed the door on him for now. It's good that he's not too diplomatic. This interview is rather very bold for a youngster who is now dropped. Also, Imam does not block his selection in Tests. We don't have a long list of bats there, he can certainly make a come back considering our batting will be exposed again on tough tours. His other competition is Shehzad and Shan Masood. He's ten times the batsman, can be very handy overseas where our batsmen falter. He can succeed. Need to up his strike rate a bit but otherwise good for Tests. any source of this claim ? Poor stuff from Sami Aslam, what he said arent the things you want to hear from a young player. Those were nothing but excuses, every player knows that there is a lot more pressure in international cricket as there are limited number of opportunities a player will get and if he doesnt perform next promising player will take his place. Nobody has any birth right to play for Pakistan, to play for the national team you have to show that you are the right player to support team’s current targets and directions. Also never understood the statement that I have been performing in domestics, its just one criteria and also being a top scorer or something when the countries best 15 players are playing in national team isnt something which is gonna help you dislodge the player already playing in national team and performing. Before anything he needs to work on his attitude and stop making excuses. All the world’s successful people dont have fear of failiure, saying that I thought every match was my last match and I didnt perform because of that is not on and thats what makes a difference in being a domestic bully or international class player. "I always felt that every game for Pakistan was my last match." 1. He omits to mention the UAE series vs Sri Lanka where he also adopted a slow approach. 2. Rumours that management aren't happy with his fitness persist, and he doesn't address this. I get the feeling this interview isn't going to do him any favours. No questions about his fitness? PakPassion.net: You seem to receive criticism for your overcautious approach. What do you have to say in response to this criticism? Sami Aslam: I believe this criticism stems from those who have seen me play in domestic cricket where I was under pressure to consolidate my spot in the team, especially after what happened to me post the tour of Australia. I became overcautious in my approach. In such situations, one does become a little defensive in your approach and this was a mistake on my behalf. Of course, I have learnt a lot from this mistake and I now know that the best way to play is to play one’s normal game and all my followers will see a much more improved cricketer in me, in the near future. Regarding him pointing out that he scored 45 vs Bangladesh. It came off 50 balls, which just wasn't what Pakistan needed with Azhar Ali already in the team. He averages 31 in test cricket and 37 in FC simply put he needs to improve there isn't any harsh treatment as far as performance is concerned the strike rate is another issue although an openers primary job is to see of the new ball but scoring at a decent rate is a good thing. Sami is a timid and defensive player. He has one game, block. He has no shot range. In the modern game players like him ain’t needed. He should never represent Pakistan in any format Again. He had four innings versus srilanka and quite a few versus westindies on placid tracks. Didn't deliver. One of the most horrible player I have ever seen. He shouldn't be no where around Pakistan A team. Please qualify your statement. What aspects of his cricket during the Birmingham Test did you find horrible? And check the rest of the scorecard when answering. Sami needs to use his Edgbaston innings as his template where his mix of defence and attack was as good I have seen from a PK player for a long time. Where he went wrong was that he became too cautious and then started to crouch too much and looked scared to play any shots. Will never forget the ODI in England where he was tried as an opener. Kept on eating up dot balls and the face on Mickey Arthur told the story. It was 24 (44) but it was an abysmal show. WOW look at the attitude on this guy, be humble otherwise you're going to be forgotten about in a snap of a finger. Too much victim mentality here. He showed no intent to score in those overseas series. That just puts pressure on the rest of the batsmen. He does seem motivated though to get back in the team. Sami Aslam scored 76 of 104 balls, I think One Days are a better format for him to bat. This Pakistan team will lose against Bangladesh. Interestingly he has been chosen for the Pakistan 'A' squad vs Australia. Let's see if he can take his chance. And India will tie against Afganistan. In his first test in England as a 20 years old youngster Sami Aslam had to face this bowling attack at their peak. He should have played next 7 Test matches but was harshly dropped. Now since he was named in Pakistan A squad so Pakistan Test squad should have announced after completion of first two FC matches btw Pakistan A and Australia. Even based on current FC form Sami deserved selection as 3rd opener over Fakhar, Shan & Imam. Fakhar over Sami makes no sense. This kid doesn't have the luxury Babar does. Babar scored a 90 on a flattish NZ track, while this guy scored an equally impressive 90 in the second innings of the same test match when the deck became even more difficult but he received zero recognition for that knock. That is definitely not what happened. I watched the match live and during Pakistan's first innings, there was quite a lot of lateral movement on offer. 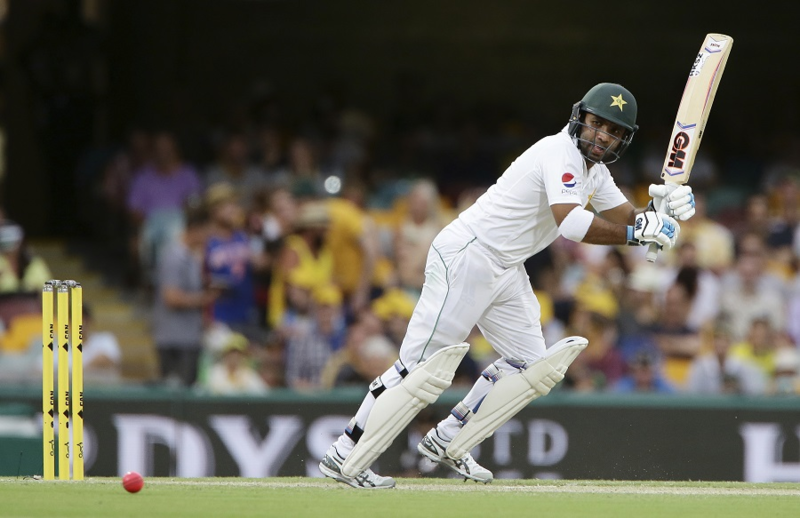 During the second innings, it had gotten quite flat and Azhar and Sami were able to negotiate the first two sessions of Day 5 with quite a lot of ease, but when they started going after the bowling, they fell apart. Either way, they aren't competing for the same slot. I think Imam is currently ahead of Sami in the pecking order, and Fakhar might play in the UAE Tests as well - If he performs then it'll be even more difficult for Sami. But if either of the two or both fail miserably (keeping Azhar aside), the door again opens for another opener. His attitude is a little disappointing, it's not a good sign when a young player is thinking so negatively about his future; but can't fault him for his recent performances, he's had a decent domestic season so far. Need to carry it on and be among the top run-scorers to force selection. Babar Azam is not the focal point here. His concern should be his own performances. From what I've heard, he has been very downbeat about not getting a central contract along with the lack of PSL opportunities. I can understand why he feels hard done by but the only way is up, he needs to be positive about his future. If he's playing with a 'nothing to lose' type of mentality, he will again go through the same struggle when he gets to the top level. He needs to rate himself and be confident that he can force selection via performances. Last edited by Abdullah719; 29th September 2018 at 06:14. In Test Cricket,Sami Aslam should have been opening from Last 2 years along with Athar Ali and Imam ul Haq should have been the 3rd opener since Sharjeel got banned. And than Fakhar Zaman getting picked ahead of Sami. Although his F.C. numbers are good but his technique is as good as Israrullah and can’t last Test Cricket. Warner (decent tech), Gayle and Sehwag have been only successful aggressive test openers. We could have tried with Sharjeel but surely not Fakhar who has numerous issues with technique against pace and spin both. Sami getting dropped was pure injustice. He has time on his side. Hopefully he'll get back in the side soon. Sami not making the most of starts in the QeA Trophy so far this season. 21, 19, 2, 51, 12, 29, 13 are his scores since the twin hundreds in the first round. Unless he gets some big scores in the last few rounds, he'll find it difficult to make a comeback in the near future. Plus imam is cashing on.Sami batting style has not been good and i reckon Micky does not like him as he always bat very slow. Indeed, it was an injustice, but the fact that he was screwed in the Misbah era on account of the dot-ball fetish has more to do with it. He could play a few shots in his youth, but was destroyed on account of the obsession with 'technique '. Correct me if I am wrong, didn't you once call Sharjeel limited? The fact that you think Warner has a decent technique is amusing, he's fine square of the wicket, but has no real idea where his off stump is, he's a baseball player who would never have made the team in the 90s, he's a product of flat pitches and poor bowling. I guess you think Steve Smith has a great technique too! Fakhar Zaman is an interesting one, even though he is capable. One failure and everyone will call for him to be dropped, then he'll play more defensive and destroy his natural game, just like Nasir Jamshed. You need to accept that aggressive players may be inconsistent; it seems the preference is for consistent defensive players who, almost invariably, turn out to be consistently poor. You’re saying that he doesn’t play balls sliding down on the leg side? No, that's not what I'm saying, it's pretty clear. Sami Aslam scored 114 runs of 109 balls and as a result his team SSGCL posted a mammoth total of 391-7. Out for a duck today. Has regressed badly. He was such an outstanding prospect. Just read his interview. He is horrible. I guess first time I have seen someone more arrogant than UA. Was hardly impressive though. Should've converted this start too lol. He has such a poor posture at the crease, he needs to stop croaching and keep his hands higher. HE looked mentally weak guy, Inzzi also did not do good by dropping him for perchie. Playing well so far he has scored 70* runs off 65 balls against Federal Areas in Pakistan Cup. I think he could be our best bat after Babar in the next 10 years if he is given the confidence. Unfortunately did not get the support from management and was wrongly discarded. He is more talented and overall better than Imam, from youth, under 19 and domestic first class level. Yet he never got a chance while Imam has gotten too many matches to establish himself. It comes down to mental toughness and even though Imam might not be the most talented, he's got a determination to succeed that most of his compatriots don't have. To play at the highest level, players need to make sacrifices which too many are not willing to make. He was strokeless! And I go to work; everyday could be my last day. I don't complain and just get on with it. This chap is mentally weak. He is still fat. Has no passion in field and does not run for the ball. Sami Aslam scored 54 runs off 50 balls against Sindh in Pakistan Cup. All times are GMT 5.5. The time now is 13:19.